The December 2015 snowpack is above average throughout Oregon and Washington, according to latest estimates from the National Weather Service in Portland. Oregon and Washington have above-average snowpack levels basically everywhere, according to numbers released this week. The color-coded maps from the National Weather Service in Portland range from light to dark blue for nearly all of Oregon and much of Washington. That means snowpack is at least 130 percent of average. One exception is the area just east of Portland. 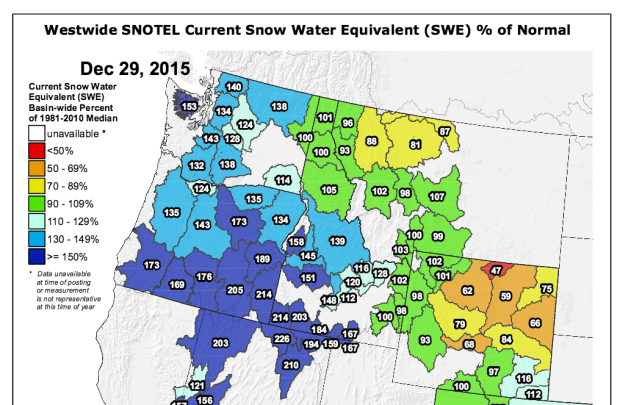 The Hood, Sandy, and the lower Deschutes region is just below that, at 124 percent. The snowpack is furthest ahead in southern Oregon, where it's at least 150 percent from the Nevada border to the Pacific, though information for much of the coast wasn't available. The Owyhee and Harney County areas in Southeast Oregon have more than double their usual snowpack for this time of year. A year ago, unseasonably warm temperatures in the Northwest created very little snow. This year, it's been colder, meaning more precipitation falls as snow in the higher elevations.